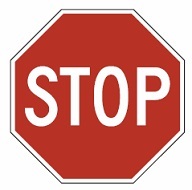 24-inch R1-1 STOP sign. Available in three levels of reflectivity: Engineer Grade Prismatic (Standard Reflective), High Intensity Prismatic or Diamond Grade reflective vinyl sheeting on .080 gauge aluminum. Used at intersections where a full stop is required at all times. This size typically used in such areas as mobile home parks, industrial parks or within shopping centers, where speeds are less than 25 MPH.